Interior painting and design really do go hand in hand. The effect that paint and color have on a space is exciting to me, whether it’s a single color, decorative finish, color blocking or a hand painted pattern. 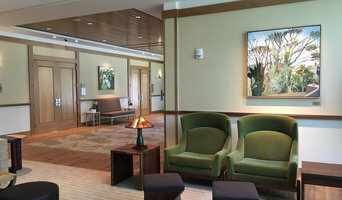 My skills as both an interior designer and painting contractor mesh perfectly, allowing She Paints to offer a truly unique service. I hope you’ll take a moment to visit the She Paints blog to learn more about me and the projects we do. I started my business in 1989. I spent 9 years working with an excellent fabric cutter who taught me my craft. I have had my solo business since 1998 working as a contractor with stores and decorators and a good sized following of private clients. I provide labor only preferring to let customers choose where they acquire their fabrics. Martin Industries is a manufacturer of custom fine furniture selling exclusively to the trades. We have over 50 years experience in design and manufacture, bringing the exceptional level of quality and attention to detail that you and your clients demand to every single item that passes through our workroom. We are a hands-on shop--utilizing time tested construction methods to bring you bespoke furniture that you can truly call "custom". ***Please note: We do not sell directly to the public. It has become my passion to take old, out dated furniture and cabinetry and make them fresh and beautiful again. This could mean painting or restaining. 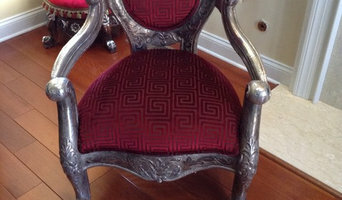 I have pieces in my inventory that can be refinished for you or you can bring a piece of your own to me. Take a look at my photo albums on my website as well as my Facebook business page French Creek Restorations. The furniture workshop of JH Conklin & Co. upholsters and refinishes furniture for people throughout the Philadelphia Metro area, South New Jersey, Delaware and the southern shore areas. The workshop also provides custom window treatment and fabric resources. You will be amazed to see how window valances and draperies can turn an ordinary room into an elegant one. If you are looking for superior window coverings for your home or business, then Unity Decorators in West Chester, PA should be your first choice. Our full service upholstery shop offers window treatments for both residential and commercial properties in Chester, Delaware and Montgomery Counties, PA. We pride ourselves on our quality craftsmanship and fast turnaround time. 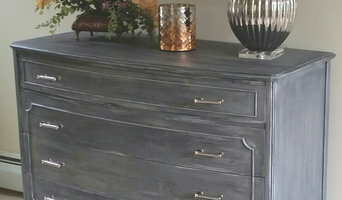 Don't throw away your old furniture; let us restore its beauty for you! Everything is custom done to meet your needs and exceed your expectations. Unity Decorators is a 4th generation family owned and operated business offering free design service and advice. We are commercial and institutional specialists. We also offer shop-at-home services for your convenience. Feel free to reach out to us, we would love to hear from you! Rebecca Holiday is an independent furniture professional. With a background in carpentry, upholstery, painting, and design work, Rebecca is well versed on all sides of the furniture business. She has a heart for well loved antiques, an eye for designing custom pieces, and the dexterity to manage the demands of commercial durability and the attention to detail required on residential show pieces. Options for eco-friendly stuffing or traditional antique methods. Wild Chairy creates one-of-a-kind functional art, combining old-world upholstery techniques with unexpected designer fabric choices. Each chair is crafted by hand using coil springs, horsehair, all natural cotton and white goose down feathers to breathe new life into these vintage treasures. Bring new life to tired furnishings with services from our slipcover and upholstery company in Bristol, Pennsylvania. With more than 50 years of experience, the team with Schwartz Slipcover Workshop, Inc. works with customers, including designers and private clients, on residential, commercial, new construction, and renovation projects. We are one of the few workrooms in the area that makes custom slipcovers, reupholsters furniture, and fashions beautiful window treatments. 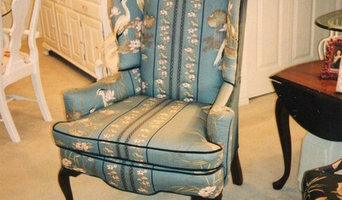 I provide custom furnishings for the home, office, or business. The services that I offer to clients include draperies, valances, cornice boards, bedding, pillows, roman shades, blinds, slipcovers, and re-upholstery, just to name a few! During our consultation, we will together decide which additions will work in your space to best display your distinct perspective to the world. I will take the time to thoroughly guide you through the process of uncovering your style, and selecting the optimal fine decorator fabrics and hardware for the space to pull your room together and showcase your exceptional style to all those who enter the room! I look forward to working with you, and welcome any questions and comments. Please feel free to call or e-mail me directly (contact information found directly to your left) so that we can discuss how we can work together to achieve inspiration in your home! Residential upholstery for designers, personal clients and universities. Re-upholstery/upholstery repair includes redoing/outfitting items like chairs and sofas with springs, padding and fabric coverings. This can also include adding fringe, piping, tufting or additional decorative elements to a furniture piece. They can also advise you about the pros and cons of different fabrics so you can choose the best type for the project in your Pike Creek Valley home. Find Pike Creek Valley furniture repair professionals on Houzz. Narrow your search in the Professionals section of the website to Pike Creek Valley, DE furniture repair.